Buy Suma Pear & Apple Fruit Spread 300g in the UK from our online shop or directly from our independent Scottish store. 75% concentrated pear juice. 25% concentrated apple juice. This is a very Dutch recipe and is usually served at outdoor ice skating events, where it is known as ‘snert’, which I cannot translate at all. It’s actually more of a winter warmer, but since it has been so cold and winter like, I thought you might enjoy it. Plus, there are no spring greens available just yet! This recipe contains OR Pear/apple spread to serve. As official Suma stockist, we sell genuine Jams & Fruit Spreads directly from our shop in Scotland and online throughout the UK. 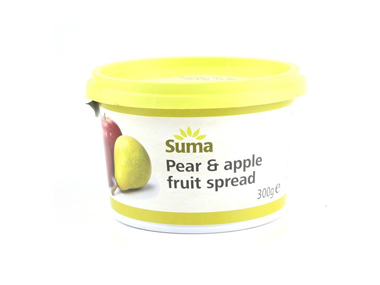 If you are wondering where you can buy Suma Pear & Apple Fruit Spread 300g safely online in the UK, then shop with us. We are an actual health foods shop; with real people selling real foods and products. Our award-winning independent shop is located in Stirling, Scotland since 1976. You can buy our Beans, pulses, grains, flours, seeds and dried fruit and other genuine Jams & Fruit Spreads in store or safely place an order with us online or over the phone. Pear & Apple Fruit Spread - Suma Pear & Apple Fruit Spread 300g in Jams & Fruit Spreads and Honeys, Jams & Spreads.